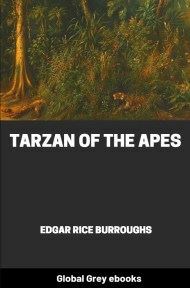 Tarzan of the Apes is the first in a series of books about the title character Tarzan. 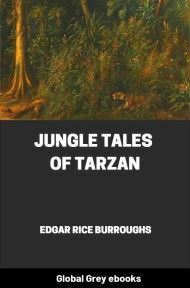 It was first published in the pulp magazine All-Story Magazine in October, 1912; the first book edition was published in 1914. 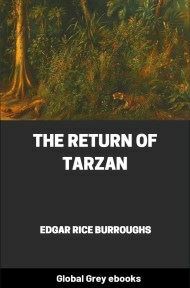 The character was so popular that Burroughs continued the series into the 1940s with two dozen sequels. 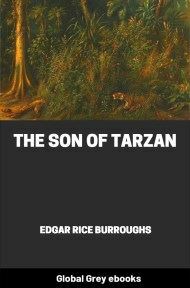 It tells the story of John Clayton, born in the western coastal jungles of equatorial Africa to a marooned couple from England, John and Alice (Rutherford) Clayton, Lord and Lady Greystoke. 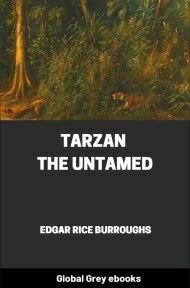 Adopted as an infant by the she-ape Kala after his parents die (his mother dies of natural causes on Tarzan's first birthday, and his father is killed by the savage king ape Kerchak), Clayton is named "Tarzan" ("White Skin" in the ape language) and raised in ignorance of his human heritage. In stature he was above the average height; his eyes were gray, his features regular and strong; his carriage that of perfect, robust health influenced by his years of army training. 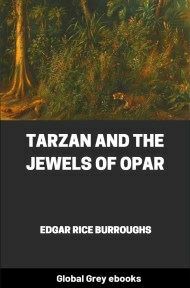 Political ambition had caused him to seek transference from the army to the Colonial Office and so we find him, still young, entrusted with a delicate and important commission in the service of the Queen.